Today’s ‘one to watch’ fixture focuses on Varsity 2015’s main event: Men’s Football. By the time the match kicks-off at 5pm, we may well know the overall result of Varsity 2015 – but this won’t take anything away from the main spectacle at Bangor City FC’s stadium. The home team go into this game two leagues above Aber, having been promoted twice in the club’s recent history. This season, Bangor finished midtable, while Aber narrowly missed out on promotion, finishing in 2nd place. Aber’s recent form is better than Bangor’s, with four wins in their last five matches, although it is worth remembering this is against weaker opposition than Bangor are used to in their league. Neither side’s home or away form is particularly telling, although with a large following at The Book People Stadium Bangor may just have the edge. Even recent Varsity history shows little between the sides, with Aber winning 2-1 in 2014, while Bangor triumphed 0-2 in 2013. Despite this, we expect Bangor’s superior league position to shine through, and bring home one last victory for the home university. Kick-off 5pm at The Book People Stadium. 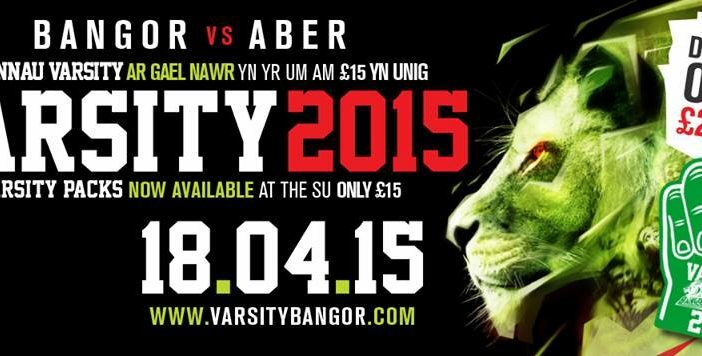 Coverage of Varsity 2015 will be available throughout the day on the Seren website (www.seren.bangor.ac.uk), Seren Facebook (www.facebook.com/bangorseren), Seren Twitter (@serenbangor), Seren Sport Facebook (www.facebook.com/serensport) and Seren Sport Twitter (@serensports). You do realise that Aber 1st team in BUCS is actually their second team right?